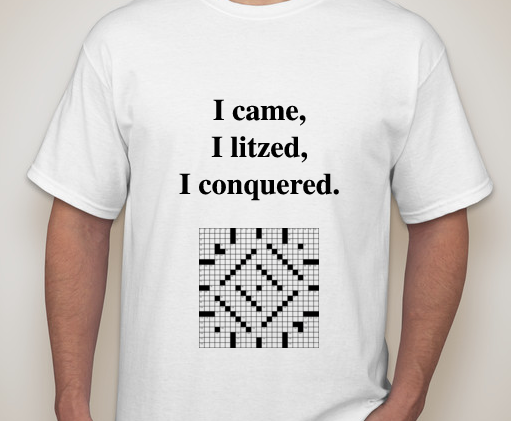 T-shirts will be ordered after the October litzing contest ends so that I can place one bulk order and include the sizes of the three winners. The cost is $20 per shirt, including packaging and shipping, for orders shipping within the United States. (For orders shipping to Canada and other countries, there is an additional shipping cost—please contact me for details.) This price will not likely cover the cost of the shirts and shipping, but whatever shortfall there is will come out of the August XWord Info donations (thanks again to Jim Horne and everyone who donated!). 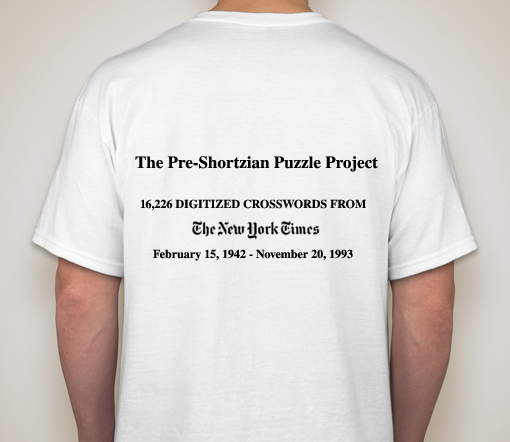 If you'd like to place an order, please send an e-mail, including your name, address, the number of T-shirts you want, and the size(s), to: preshortzianpuzzleproject at gmail dot com (using the usual format). I will send you payment information, and your order will ship in November. 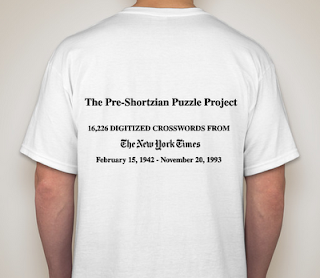 Thanks for supporting the Pre-Shortzian Puzzle Project! 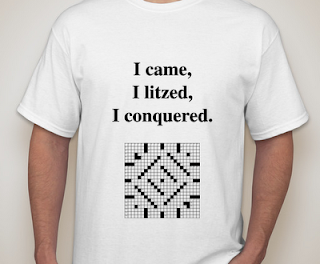 Litzers are the volunteers who digitized the pre-Shortzian puzzles. The name is derived from Literate Software, the company behind Across Lite. Please see the comment above!